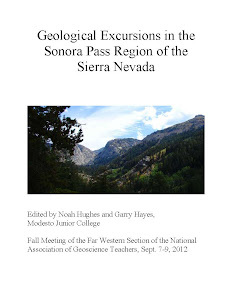 Here at Geotripper I usually write about my travels, geological and otherwise. I feel inordinately lucky to have a job that allows me to travel a lot, introducing my students to the incredible world that lies beyond the borders of their town. But there are certainly a great many places I have never visited, and may never have the chance to. I am also lucky to have a cadre of former students who also travel a lot, and some of them get to places I could not reach myself. For instance, one of my former students was on the logistical crew of an Everest expedition a year or two ago, and he brought back a few precious stones from high on the mountain. And then there are Noel and Art, a couple who are spending their time in Nepal and Africa. This week Art sent me a beautiful collection of photographs from their exploration of Namib-Naukluft National Park in Namibia. So today, I join you as an armchair geologist, enjoying the scenes of an incredible place in a far-flung location of our planet. Deadvlei, a former oasis in Namib-Naukluft National Park. The dead trees are acacias. Namib-Naukluft National Park encompasses just over 19,000 square miles, an area larger than Switzerland, or for you Californians, the area of about 18 Yosemite National Parks. It's the fourth largest national park in the world. 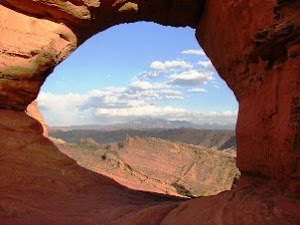 It preserves the Naukluft Mountains and a vast region of sand dunes. The main visitor destination in Namib-Naukluft National Park is Sossuslvei, a portion of the dune field that includes playas and an almost always dry river channel. In the Google Earth image above, on can see the light-colored playas (dry lakes), and the dry channel to the right. One of the world's tallest sand dune can be seen in the area. It's called (very imaginatively) Dune 7. It is 1,256 feet high (383 meters). 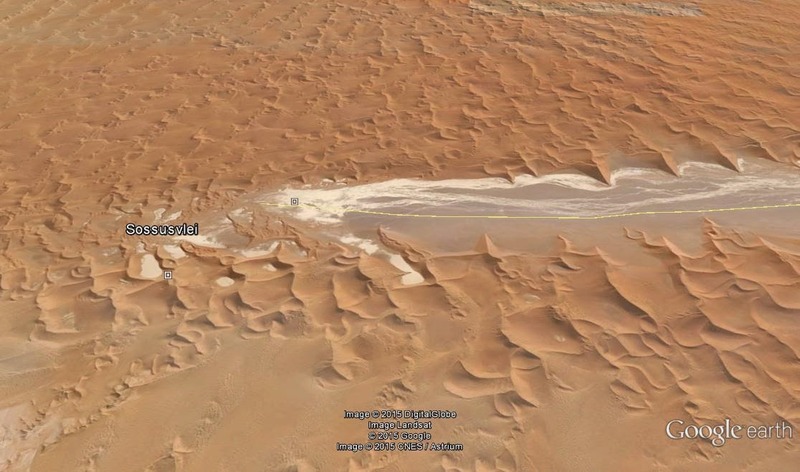 The second Google Earth provides a regional context (Sossusvlei is on the bottom of the image on the left side; it is the long narrow gray area). The north-south length of the map is around 150 miles. Namibia is on the west coast of South Africa, and it was part of South Africa until 1990, when the country became independent. The region has been a desert region for tens of million of years, which explains the wide distribution of the sand deposits. The sand is carried into the region along the coastline, and constant onshore winds blow the sand inland. The orange area on the left next to the coast is the vast north end of the dune field. The Namibian desert is one of the driest in the world. It is dry because of a cold ocean current offshore that prevents the evaporation of water and causes the condensation of the atmospheric water offshore. Sometimes the fog will come onshore, providing a bit of moisture, but generally it is as dry as any place in the world except for some parts of the Atacama Desert in South America. Death Valley in California is practically humid in comparison. The desert is described as one of the oldest in the world, dating back tens of millions of years. Contrast this with the Mojave Desert and Death Valley, which have existed as deserts for only 2-4 million years, with wet climates during the occasional ice ages. The source of all the sand in the Namib is the coastline of the Atlantic Ocean. Rivers provide sand to the coast and longshore currents and beach drift move the sand into the desert shoreline. The onshore breezes carry the sand inland. There are several kinds of dunes, based on the amount of available sand, and the variability of wind directions over the course of the year. Many of the dunes of the Namib desert are seif (or longitudinal) dunes, long parallel ridges of sand that extend for many tens of miles. When the dunes get backed up against a mountain range, they will have a much more irregular outline that sometimes resembles a starfish. They are called star dunes. Such dunes can accumulate vast amounts of sand and grow to great heights. Deadvlei is one of the most popular photography spots in the park. The barren dead acacia trees were once watered by an ephemeral stream that changed course. Some of the dead trees may be hundreds of years old. Dunes move when sand is carried from the base of the windward side and dropped down the lee slope, called the slipface. The dunes will migrate until they reach mountain ridges that interrupt the winds. Many of the park visitors elect to do a flyover of the park. The vastness and loneliness of this landscape is overwhelming. I would not want to be lost here. One section of the park contains exposures of a much older example of sand dunes. The billion year old rocks display the same kind of cross-bedding (diagonal layers representing the buried slip-face of dunes) that the modern day desert dunes possess. It's a marvelous example of uniformitarianism, the idea that processes that we can observe happening today also happened in the past (because the laws governing nature have not changed with time). Many thanks to Art and Noel for sharing these wonderful photographs! Please regard them as copyrighted, however. I think they won't mind if the shots are used in school projects and the like, but if you want to use them in any formal publications, please notify me and I will forward their contact information. Yet another tease. Namibia is close to the top of my bucket list. Great shots by Art and Noel and thank you for telling the geologic story.